What are Millets? It is a group of cereals which are mostly tiny in size, round in shape. There are about 6,000 varieties of millet throughout the world in different colors too. Millets are gluten-free and rich in B vitamins (especially niacin, B6 and folic acid), calcium, iron, potassium, magnesium, and zinc. The bran layers of millets are good sources of B-complex vitamins. I have tried to give the Millets name in English. hindi and tamil. While doing Indian Food Odyssey, this was one of the menu i was planning to make for Tamil Nadu state. But didn't have time to make it in time. I was fortunate to find this varagu arisi/kodo @ the indian store Al Adil Super Market here in Sharjah. Happily picked up 2 packets and since then i m enjoying cooking them. 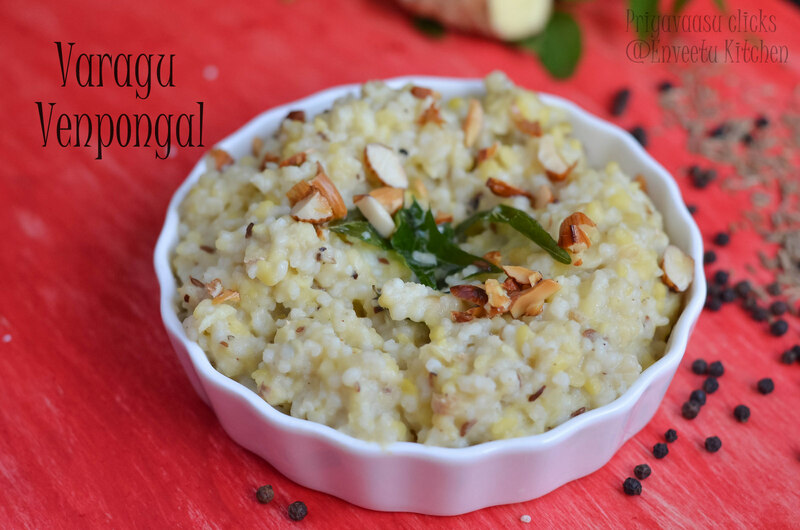 This Venpongal is an absolute favorite in our home. 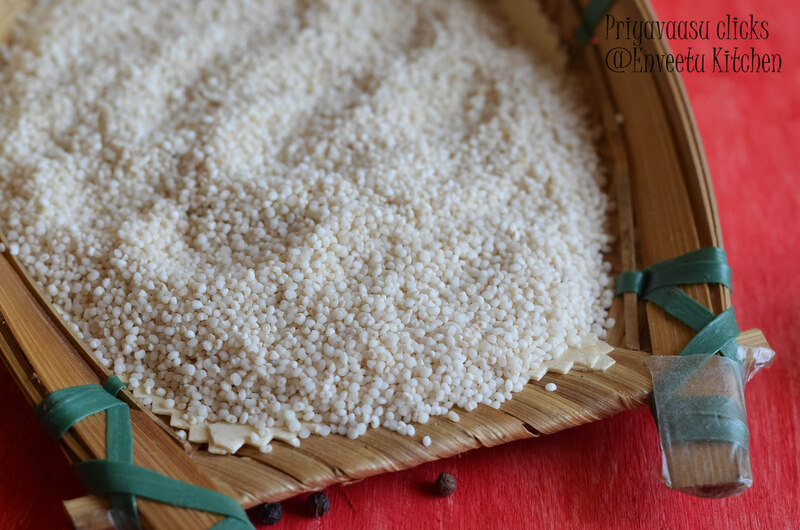 Kuttu loves pongal and so these days i make only millet pongal and not the regular rice one. None know the difference until you reveal it. So, go on and bring back the millets in your regular diet and live healthy. Roast varagu arisi/Kodo millet and moong dal separately until they turn golden. Take them together in a bowl, add green chili ,salt and double the amount of water and pressure cook for 4-5 whistles. Once the pressure releases, take it out. Heat oil/ghee given under "Tempering" in a kadai, add chopped almonds/cahsewnuts to this and roast till brown, remove and drain on a paper towel and set aside until use. In the remaining ghee/oil, add cumin seeds, curry leaves, shredded ginger and saute until aromatic. Add the pressure cooked varagu arisi & moong mix to this add milk and water mix to this, add freshly ground pepper, mix well and let this simmer for 8-10 minutes. 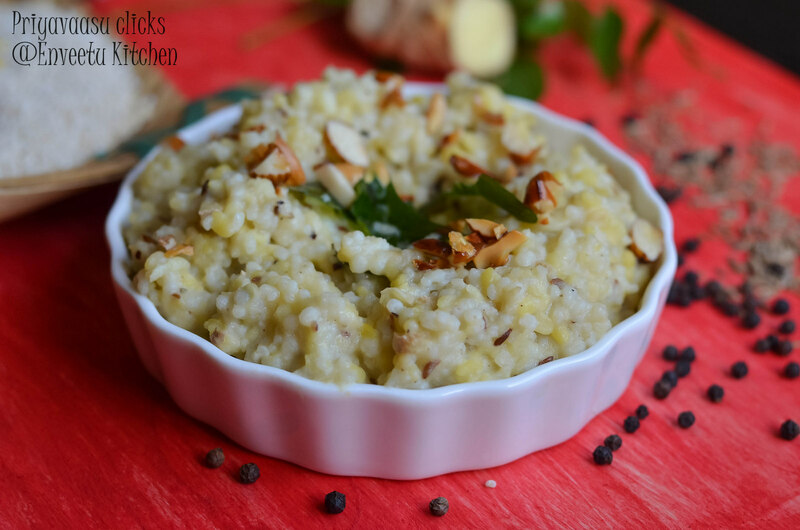 Sending this power-packed millet to Kids Delight-Fat Free Kid's friendly recipes, happening @ +Priya Suresh's Space, an event by +Srivalli Jetti , Come join us for breakfast, event happening @ +srivalli jetti space. Lets Cook with pulses, happening @ Simply Food. 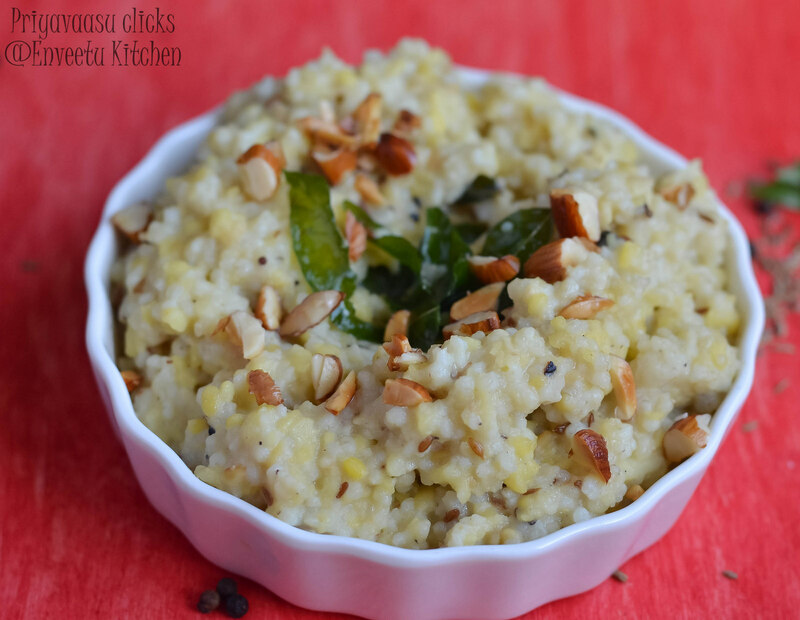 Wat a delicious,droolworthy and healthy venpongal, seriously hard to resist.